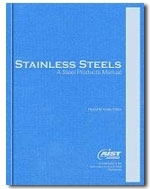 This pocketbook covers such topics as standard steels, chemical ranges and limits; hot-rolled carbon strip steel; cold-rolled carbon strip steel; cold-rolled high-carbon (formerly spring) strip steel; high-strength, low-alloy strip steel; alloy strip steel; plus a list of ASTM specifications for steel strip. The revised Bar Steels: Steel Products Manual provides concise information pertaining to the manufacturing processes, product characteristics and uses of bar steel. 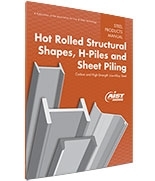 Updated under the supervision of the AISI Bar Applications Group, Bar Steels contains current North American bar product manufacturing practices and related technical information. The revision includes an expanded section on the production of hot-rolled steel bar products and a new section on the selection of bar products for an application. This manual describes the four types of tin mill products that are commonly produced: electrolytic tinplate, electrolytic tin coated sheet, electrolytic chromium coated steel and black plate. Sections include product designations, manufacturing methods, physical characteristics, coating characteristics and more.